My first bread bake of 2018! 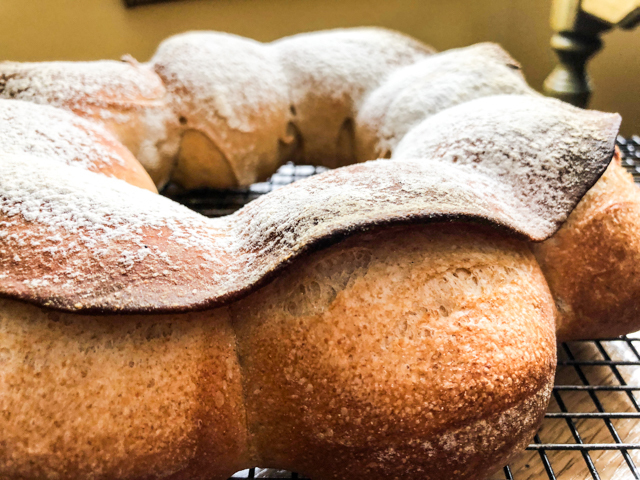 The recipe comes from the Craftsy online class “The Baker’s Guide to Artisan Bread Shaping” taught by Chef Ciril Hitz. You can use any bread dough you like, as long as the hydration level is not too high (65% is a good starting point). 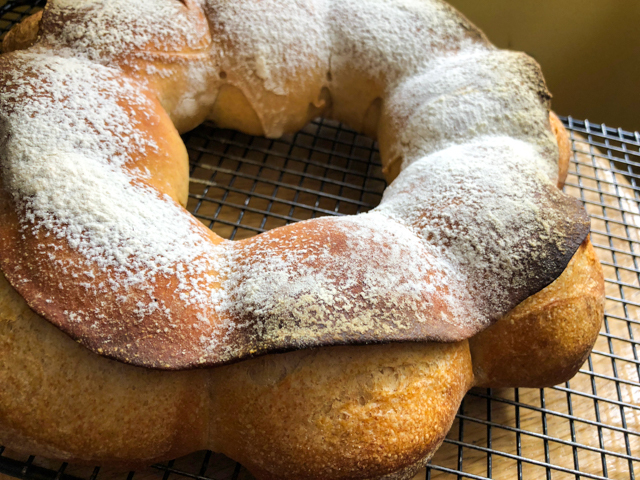 For the couronne, you will need almost a full kilogram of dough. Roughly that would be 600g flour (I used 550 g all-purpose white flour and 50g whole-wheat), 390 g water, 12 g of salt, 3 g of yeast. Once the bread goes through the bulk fermentation, preferably in the fridge, you can proceed with the final shaping. You can also double this recipe that calls for a pre-ferment instead. Again, the most important here is the hydration level to be kept more or less at 65%. If you performed the bulk fermentation in the fridge, bring the dough to room temperature and leave it for 30 minutes. Then, divide it in 9 portions of roughly 90g each (you will have a small amount of dough leftover, pita anyone?). Shape eight of the balls as tight rolls, and reserve a portion of 90g unshaped. Roll the last portion of 90g of dough as a circle measuring about 10 inches in diameter. It should be quite thin, so work patiently and allow the dough to rest in case it tightens up on you. (It’s the gluten speaking, but it calms down with some time to itself). 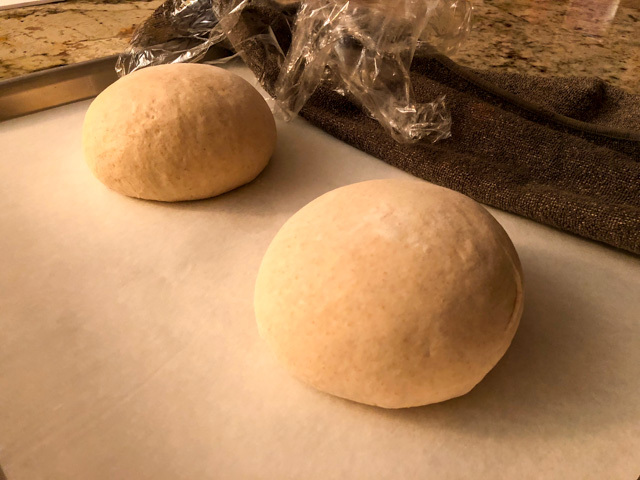 Once you get the dough rolled out, brush a little olive oil on the edges, then place the eight balls of dough sitting on the perimeter, making sure the seam is facing up. Now let the shaped bread rest for 60 to 90 minutes, depending on the temperature of your kitchen. Since it was pretty cold, I left it proof for a full 90 minutes. Once that is completed, make cuts with a very sharp knife on the center of the rolled dough, in a star-shape, so that each ball is facing a little triangular flap of dough. Carefully lift the edge of the triangle and fold it over each ball of dough, sticking it firmly at the top. I found it easier to use small scissors to help with this step. Now carefully flip the whole thing over, and dust the surface with flour. You can see the whole process in the composite picture below. As I mentioned before, I think the Craftsy classes online are worth every penny. 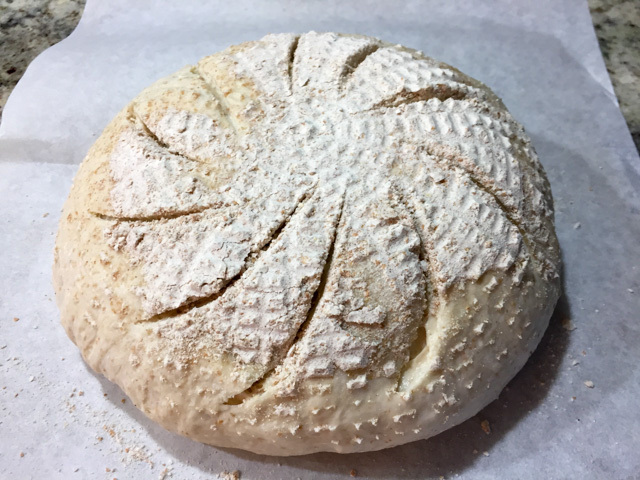 Even though I am giving you a general idea of how to make this bread, you can bake it pretty much in real-time with Chef Cyril, getting all the tips from him, including how to shape the balls to get optimal surface tension. As you know, I only recommend things I love and this class is definitely one of them. 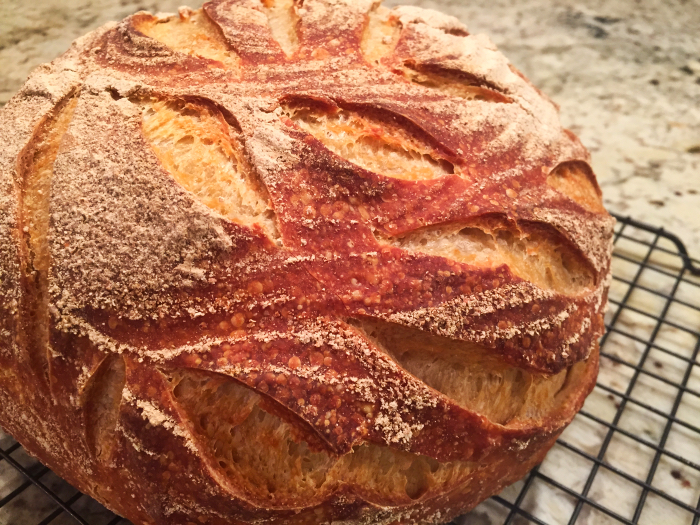 Lately I’ve been playing with different, fun ways to slash sourdough boules. 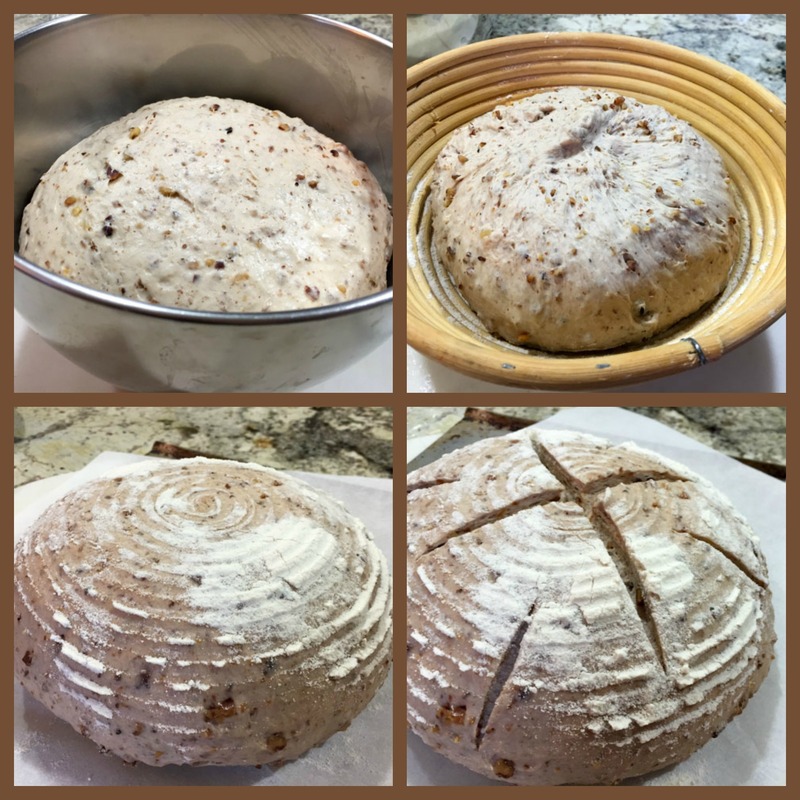 One thing led to another, I found myself buying a Craftsy online lesson by Ciril Hitz called The Baker’s Guide to Artisan Bread Shaping. One of the breads that caught my eye was The Tabatière, a classic French style bread (from the region of Jura), shaped to resemble a purse used to hold cigarettes. Talk about traditional bread baking, this is it. I got so excited about this recipe that I pushed all other blog posts to the side to share it with you right away. The formula of the bread is actually quite simple, you can use any dough you like, as long as it’s more on the firm side to stand the shaping. For instance, for two small loaves, mix about 1kg dough at 65% hydration. Roughly that would be 600g flour (you can use a mixture of white with a touch of whole wheat or spelt), 390 g water, 12 g of salt, 3 g of yeast. 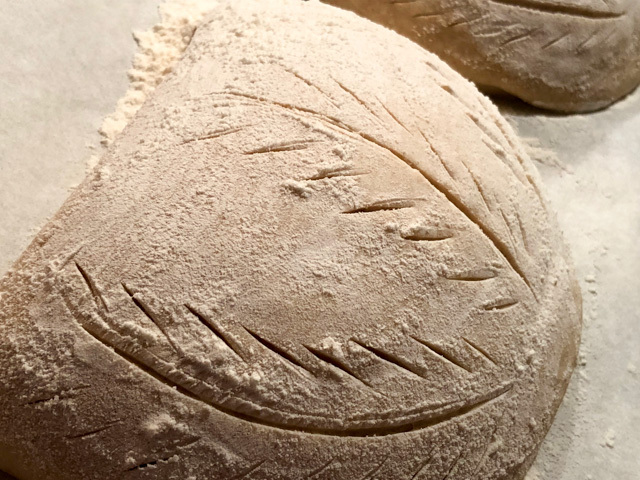 Once the bread goes through the bulk fermentation, preferably in the fridge, you can divide it in two, pre-shape them as a ball, then proceed with the final shaping. You can also follow this recipe that calls for a pre-ferment instead, making a single Tabatiere with it instead of two. Again, the most important here is the hydration level to be kept more or less at 65%. 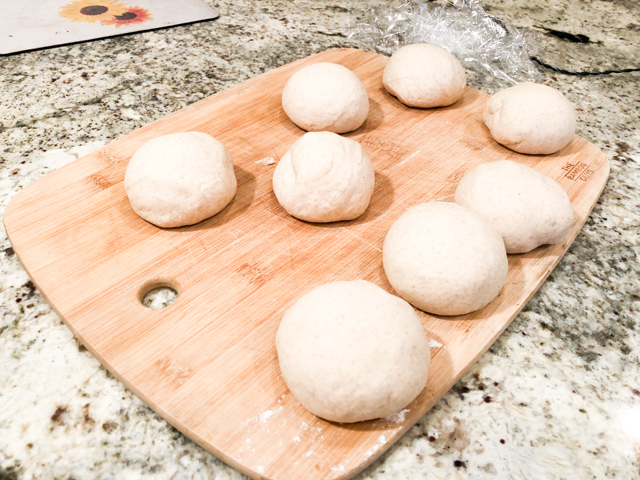 IT ALL STARTS WITH THE DOUGH…. Each ball more or less 500g of dough at 65% hydration. Any combination of flours you like. Yes, that’s more like it! Once it’s the correct size, brush a little olive oil right on the edge, so that the flap will not glue to the ball of dough, and once in the oven, it will be more open. This composite photo hopefully shows you how the whole process is done. 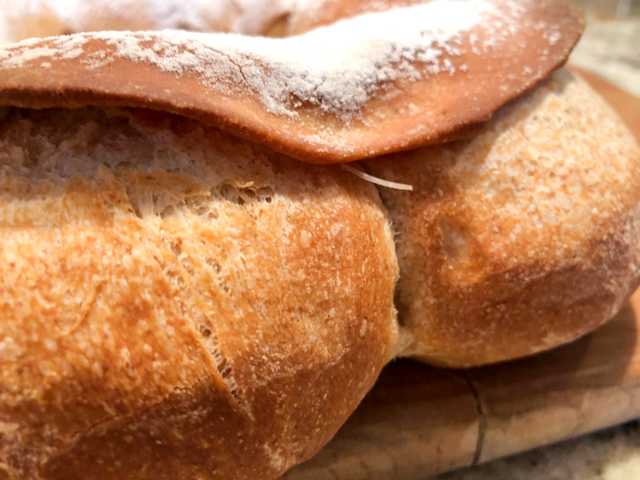 Once the little “purse” is shaped, let the bread rise for 90 minutes at room temperature. Next, give it a nice sprinkle of flour, rubbing it gently on the surface. And with a decisive frame of mind, but keeping in mind that you do not want to cut all the way through the flap you covered the bread with, slash it. You can use any pattern you like, but this one is considered the most authentic. Slash from the bottom to the top. There, the beauty is ready for the oven! The top one was baked in the clay cloche so the dusting of flour stayed nicely on the surface. 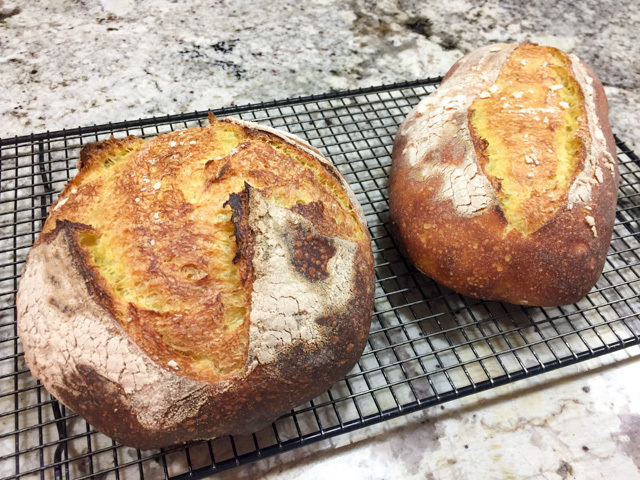 The second loaf, under additional steam, had the flour pretty much baked into it, generating a darker crust.They are different, I have a hard time deciding which one I liked the most. It was good to know, though, that baking in the clay cloche worked quite well. The “lip” of the purse could have lifted a little more, I suppose I should have stretched it thinner and maybe added a bit more olive oil, but overall I’m happy with the way it turned out. 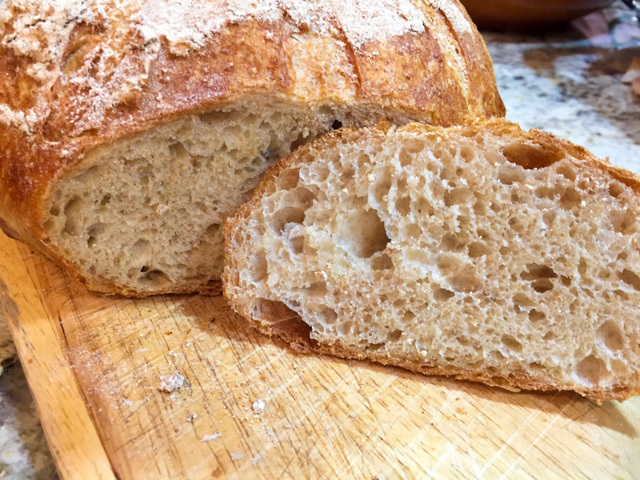 The crumb is more on the tight side of the spectrum, as expected from a bread with low hydration level. 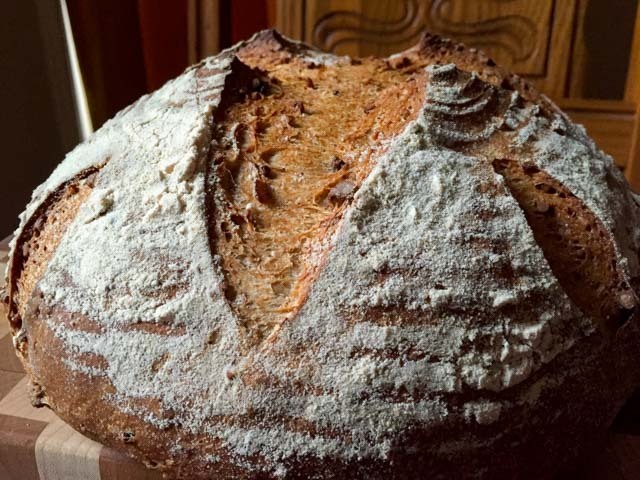 I am quite curious about the possibility of using a sourdough formula for the Tabatière; I might experiment with it in the near future. I cannot recommend Craftsy classes highly enough. This particular lesson from Ciril Hitz is simply outstanding! From baguettes to very sophisticated bread shapes (Sun Dial is unreal), you will learn to bake them all. Clear instructions, pretty much in real-time. Brilliant! 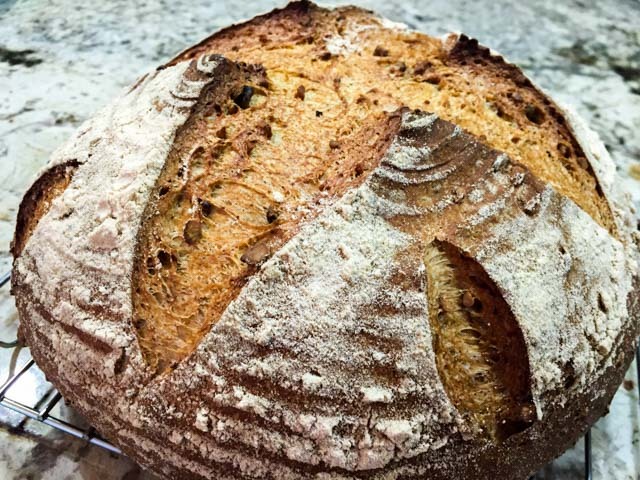 If you are into bread baking, consider getting this online class. Worth every second. And no, I do not make a single penny from your purchase. As with everything else on my blog, I only recommend it if I absolutely love it. 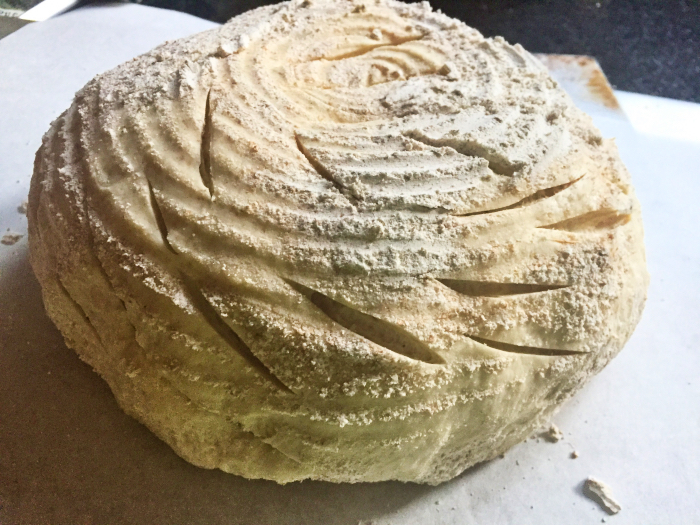 So many months without baking a single sourdough bread! The problem is we don’t eat a lot of bread. One bake lasts us for a long time, as after enjoying a couple of slices, the rest goes straight to the freezer. But I am still quite passionate about bread baking, and have a list of recipes I intend to try. They just sit and wait, poor things. Like this one, from Discovering Sourdough Part II, by Teresa Greenway. 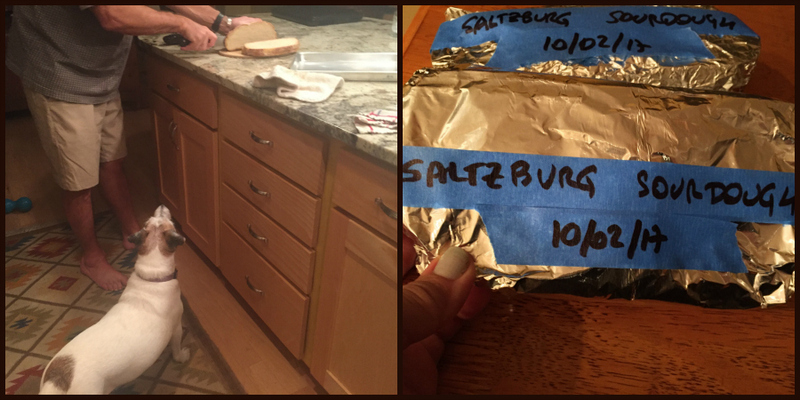 In theory, you need a specific sourdough strain from Austria, but I used my good American sourdough, born 9 years ago in Oklahoma, and headed to his teenage years in Kansas. I am sure Teresa will forgive me. But, did you know you can actually buy many sourdough starters from all over the world? Pretty amazing. Take a look at this site. 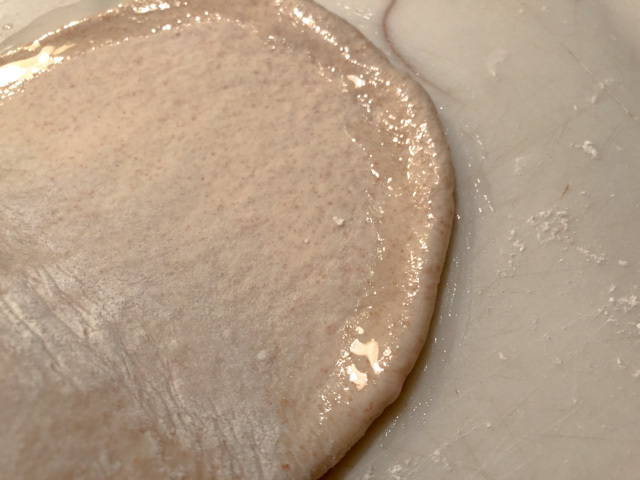 Of course, over a long period of time a sourdough might change and incorporate yeast and bacteria from the new environment, but it’s fun to start from a pure culture born in some exotic, distant place. 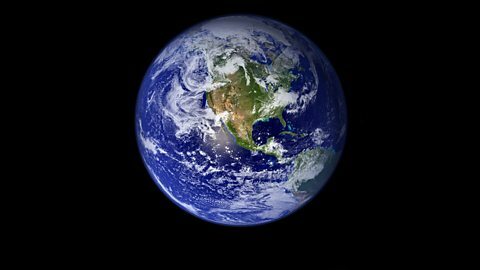 In the site, they actually dispute the claim that cultures change, but until I see solid scientific evidence it’s all a bit in the air (pun intended). Mix all ingredients, except salt, just until incorporated and then allow the dough to rest for 20 minutes (autolysis). After autolysis, add salt and mix dough on low-speed for about 2 minutes. Then let the dough bulk ferment (first rise) for 6 hours or until doubled. Fold it once each hour during the six-hour bulk fermentation. After bulk fermentation, place the dough onto a lightly floured surface and knead enough to gather into a ball. Shape it into the general shape you wish and then allow the dough to rest for 5 – 10 minutes (bench rest). 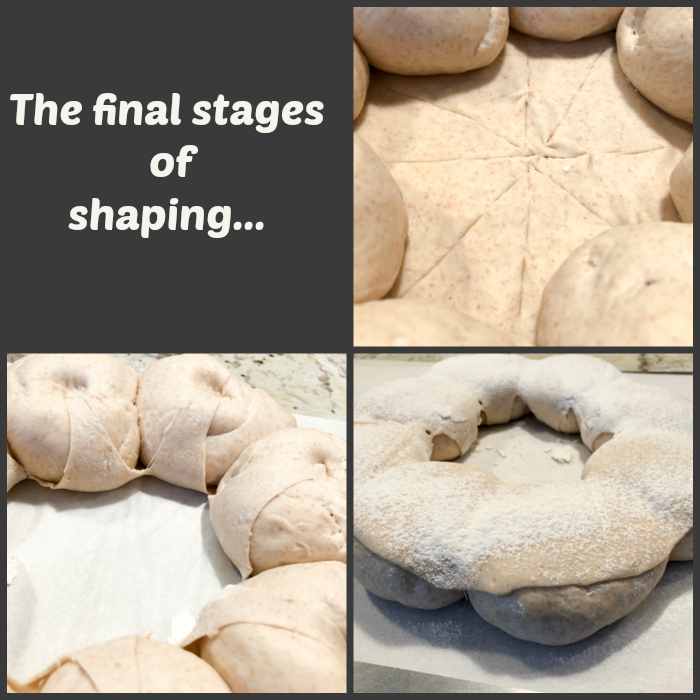 After benching shape loaves into their final shapes and put them into the proofing baskets, pans, or couche. Cover the dough with plastic bag and refrigerate overnight. 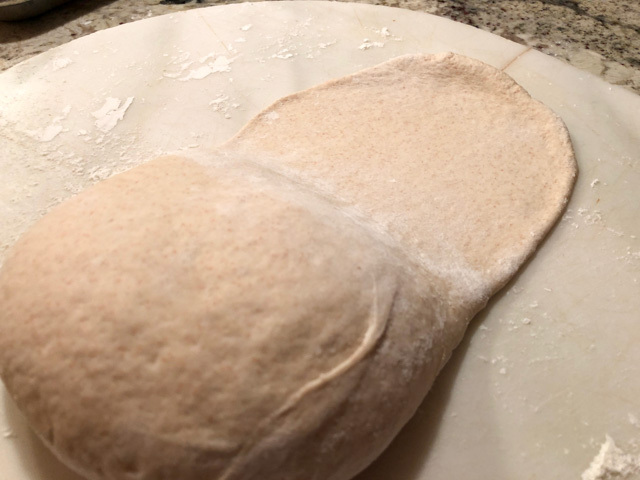 In the morning, allow the dough to final proof for 2 – 3 hours (whenever the dough looks about 1 ½ times its size and is spongy) then turn dough out on peel and slash, cover with roasting lid moistened with water, and bake in a 425F degree oven for 30 minutes. Alternatively, use your favorite method to generate initial steam. After 30 minutes, remove roasting lid, turn down the oven to 400F degrees and continue baking for about 10-15 more minutes, turning halfway for even browning. Bread is done when the internal temperature reaches 200-205F. Take out loaf and cool on a rack. Comments: Inspired by my friend Elaine, I decided to be a bit more daring and creative with the slashing. Elaine always comes up with amazing patterns on her bread. So I took a deep breath and went at it with a razor blade. 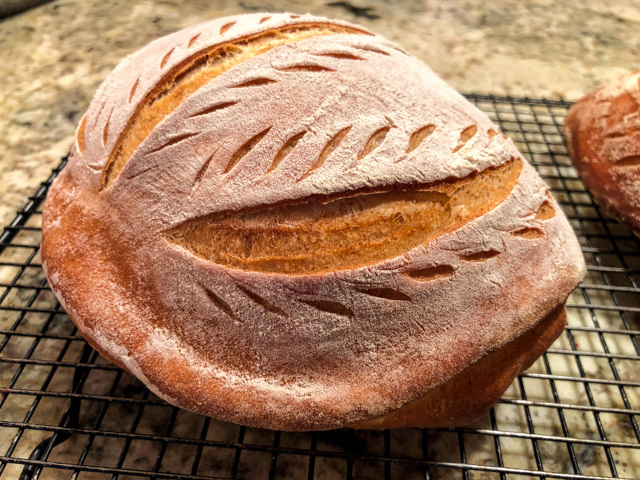 I love the way the bread turned out, and intend to keep practicing, as the slashes on top were not exactly the way I wanted. 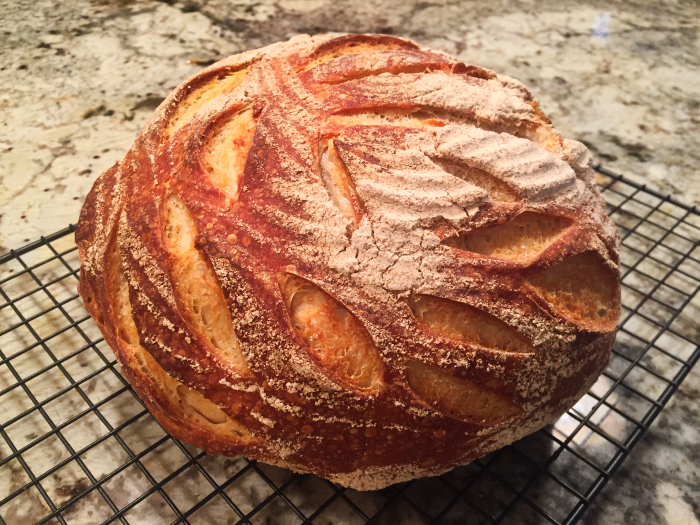 My sourdough ended up quite assertive this time – it was hibernating in the fridge for a very long time, so I refreshed it and fed it daily for a full week before making the bread. Not sure if that affected the level of acidity, but it was really good. Teresa’s recipes all call for 166% hydration, which is easily translated into equal volumes of flour and water. It is easy because you won’t even need a scale to keep the starter going, simply pick your desired volume, and mix half and half. I refreshed it using 1/2 cup water and 1/2 cup flour. It ends up close enough to 166% hydration. For the final starter, I just made a bit more than needed for the bread, so I could keep it for the next baking adventure. Teresa, thanks for giving me permission to publish this great recipe! EIGHT YEARS AGO: Got Spinach? Have a salad! 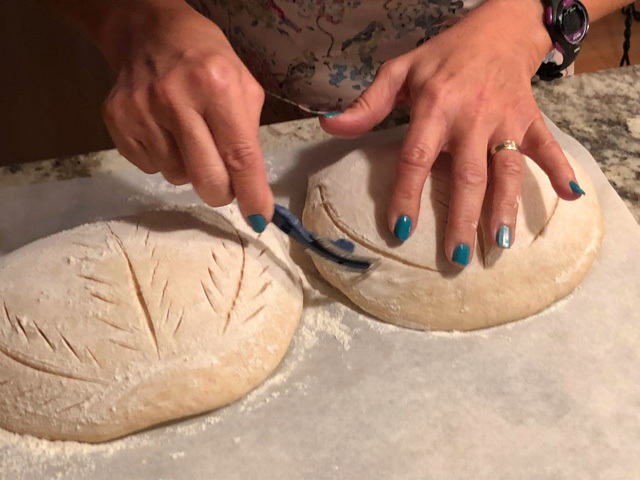 My mile-long list of breads “to make soon” was shaken up by a recent post published by my friend Karen. It passed in front of all others, elbowing a Rustic Sourdough here, a Danish Rye there, a couple of Pretzel Loaves, and a few Crumpets. 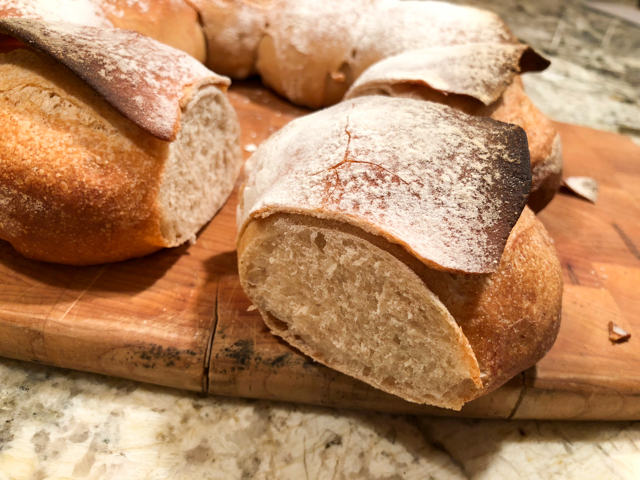 I could not get it off my mind, because not only her bread looked amazing, but she developed the recipe to make it happen in four little hours! 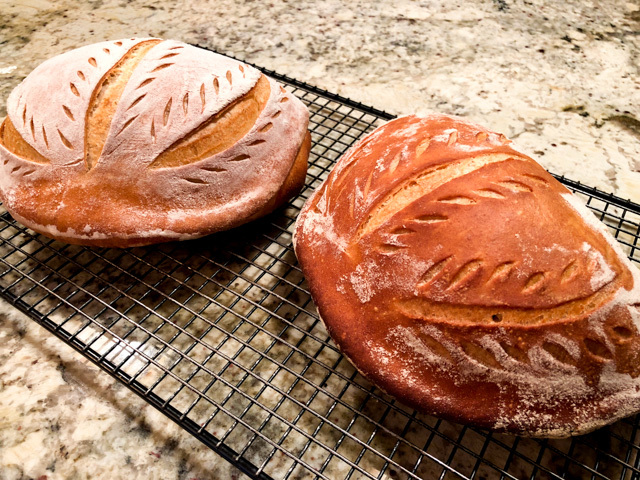 Four hours from the time you grab the flour to watching the bread cool down and sing back to you… I simply had to try it. With just a little adaptation, using spelt flour instead of regular whole-wheat. Why? My whole-wheat was in the freezer and I had just a small amount of spelt left in the pantry, which turned out to be exactly the 50g needed for the recipe. It is called flour fate. Rest the dough 20 minutes. Fold. Rest 20 minutes. Fold. Bulk proof 2 hours. (I proofed for 3 hours due to unforeseen circumstances). Shape. Final rise 1 hour. Heat oven to 450F. Bake for 40 minutes at, 30 minutes covered, generating initial steam using your favorite method. Comments: As you can see, I went with a different pattern for slashing the dough, but when it opened, it had a mind of its own. I did not get a star-shaped pattern, but it’s ok. I definitely want to keep practicing. The bread had excellent oven spring, and made all sorts of nice noises while cooling, something that never fails to make a baker happy. The bread was out of the oven a little after 5:30pm on Saturday, and my original plan was to slice it next day. However, when Phil saw the bread he gave me two options: slice it right away and hand him a slice, or witness him going at it with his hands and teeth. I chose the first option, and contrary to all my principles, sliced the bread while it was still warm. The crumb suffers a little, but truth be told, nothing beats the taste of bread fresh out of the oven! This would be an ideal bread for those a bit afraid of all things yeast. 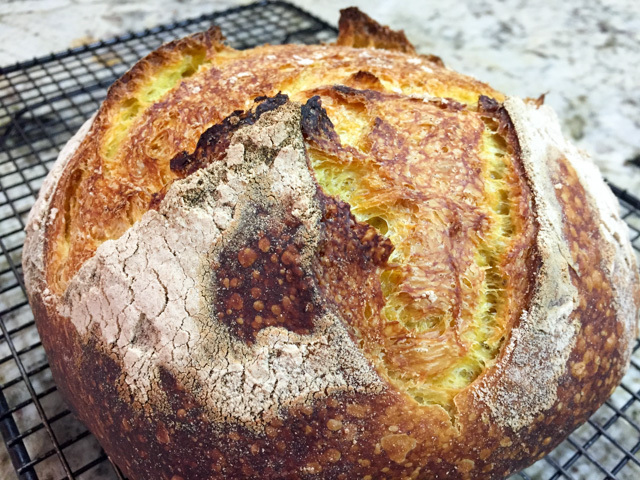 No sourdough starter needed, pretty straightforward method, and wonderful results. Plus it all happens in a reasonably short time, as far as bread baking is concerned. Karen, you outdid yourself with this one! Bewitching Kitchen is a food blog and I like to keep it focused on the subject with only small detours into two passions of mine: science and fitness. I must say, though that a couple of recent posts by bloggers I follow echoed deeply inside me, so I share them with you. First, I invite you to read A Texan New Yorker’s take on chili. I must make that recipe in honor of a family I admire and already miss immensely. Then, please stop by Cecilia’s site, who just published a post called “I am an immigrant.” While you are reading it, keep in mind that I am one, one who got her green card and naturalization through long, complex processes several years ago. Her article is a very well-written piece describing the pleasure and pain associated with leaving your home country and starting all over somewhere else. I firmly believe that we are stronger when we are together. That prejudice and divisiveness should be fought against. When we have friends over, I love to welcome them with a loaf of homemade bread. I did that when our friends Denise and Helio stayed with us over a weekend (see my post here), and last month did it again when our friend Cindy stopped by briefly on her road trip from St Louis to Oklahoma. I made a batch of parsnip hummus and thought that a loaf of sourdough with a subtle hint of Middle Eastern spices could be a good option to enjoy it with it. 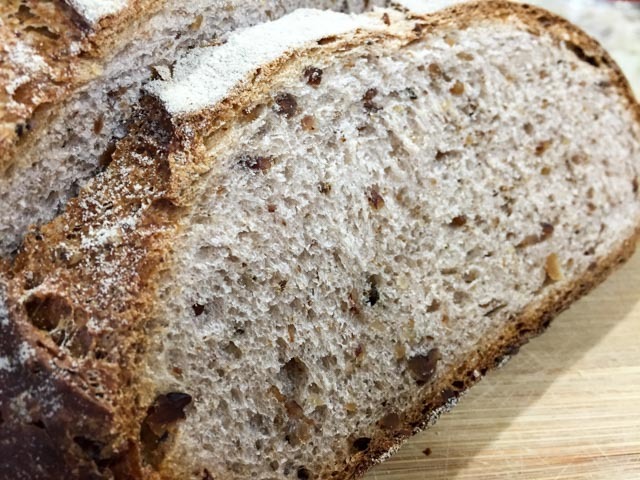 I did not want to add anything else to the bread, was hoping for a nice, golden crumb, with no nuts or goodies to distract from the spice components. I know you cannot judge if I succeeded as far as taste is concerned, but what do you think of its looks? In a large bowl, whisk the sourdough starter with the water. Add the flours, spices and salt. Stir until you have a soft, sticky mass. Cover the bowl and leave it for 10 minutes. 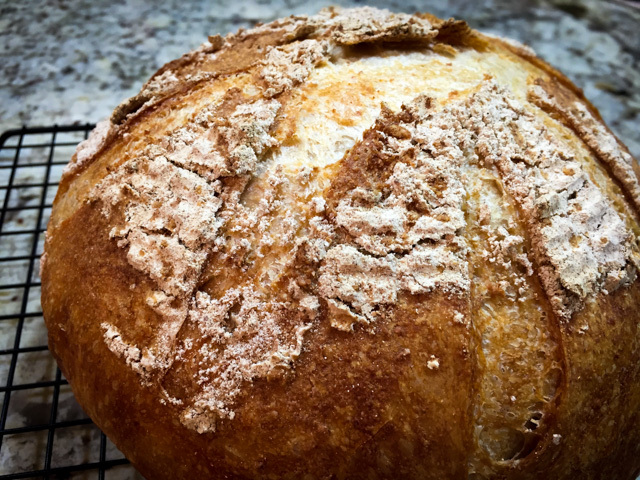 Perform a series of quick kneads, 10 seconds or so, making sure you incorporate as much of dried bits of flour as possible, but if something remains stuck to the bowl, don’t worry about it. Leave the dough to rest for 10 minutes. Remove the dough to a slightly oiled surface. Wash and dry the bowl, Coat it very lightly with oil. Knead the dough again for a quick 10 second period and put it back in the clean, oiled bowl. Wait 30 minutes. 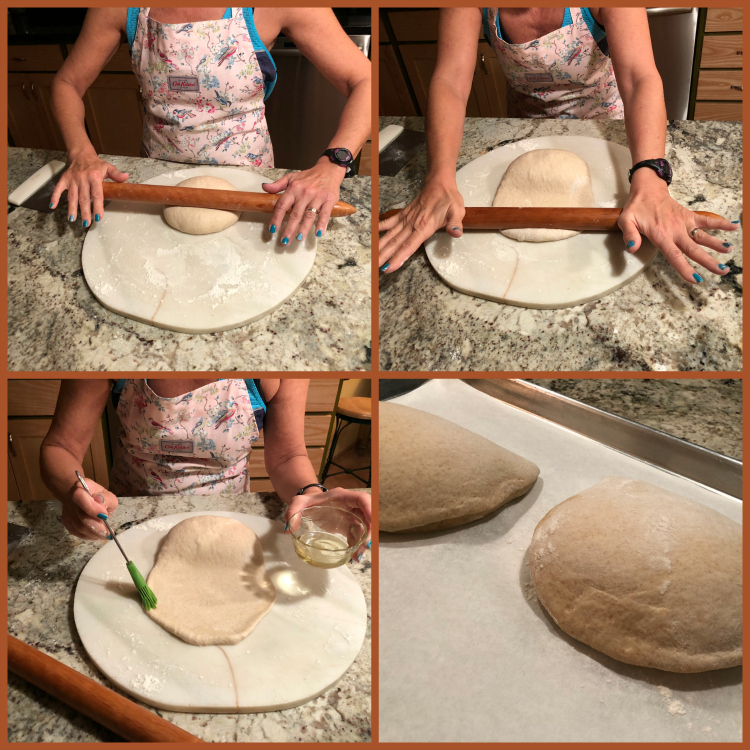 Perform another cycle of kneading, or if you prefer, use the folding method, in which you stretch one side of the dough way up in the air, bring it over the full extension of the dough, turn it, repeat it four or five times from all directions. Wait 1 hour, with the dough covered lightly. Perform another series of kneading or folding. Wait one more hour, knead again. Wait 2 hours, divide the dough in two, and shape each half in a round or oblong shape. Place in an appropriate containers lightly coated with flour, seam side down. Leave them for a final proof for 4 hours. Invert the dough on parchment paper, slash the surface, and bake at 435 F with initial steam for a total of 45 minutes. I like to use a Dutch oven covered for the first 25 minutes, then remove the lid and allow the bread to brown uncovered for the final 20 minutes. Cool the bread on a rack before slicing. My batard formed a little bulge in one side, and I also would prefer a more pointed edge. Well, gotta keep trying. Still tasted pretty amazing, and as we all know, beauty is skin deep. HA! The mandatory crumb shot! What I love the most about this bread is the smell not only while it baked, but when a slice is gently warmed in the toaster oven next day. The hummus went perfectly well with it, but it was superb as a player in the ultra fashionable avocado toast. I smashed a slice of ripe avocado over the bread, sprinkled drops of lime juice and a light dust with Tajin. Sorry, no pictures, I think the blogosphere is already crowded with avocado toast photos, no need for me to add yet another one. But, do try it if you make this bread. hosted by Karen, the Bread Baking Goddess. Heat the oven to 400 F. Spread the pecan and walnut pieces in a baking sheet and toast them in the oven for about 7 minutes. Let them cool. Pulse them in a food processor until you have both crumbs and medium pieces. In the bowl of a stand mixer, add the yeast, honey, and warm water. Stir and let stand for about 10 minutes. Add the olive oil, flour, sea salt, and walnut pieces. Stir with a dough whisk or wooden spoon until the ingredients are combined. Knead with the dough hook for about 5 minutes, until the dough is fairly smooth. Place the dough into an oiled bowl and cover with plastic wrap. Let rise until doubled, about 75 minutes. Lightly flour your work surface and turn the dough out without deflating it. 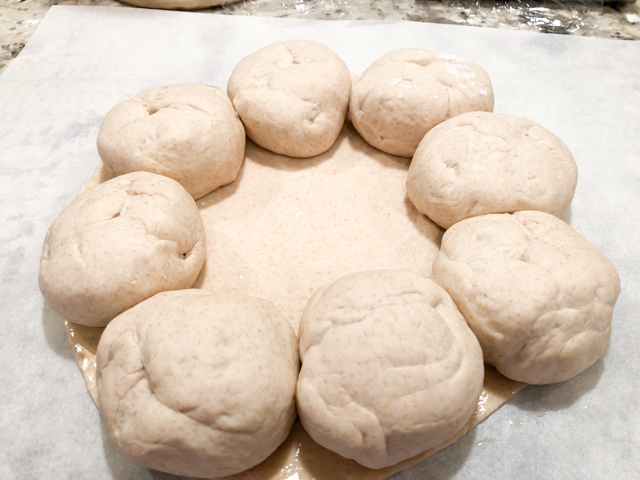 Shape the dough into a ball and place in a floured banneton for the final rise. Cover with oiled plastic wrap and let rise until doubled, about 60 minutes. While it rises, heat the oven, with a baking stone (if you have one) on the middle rack, to 400 degrees F. When the dough has doubled, invert it on a sheet of parchment paper, slash the surface with a razor blade and quickly place it over the baking stone. 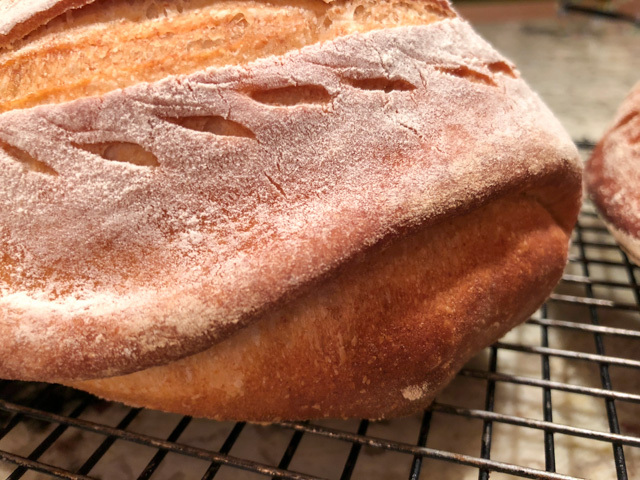 Use your favorite method to generate steam (I invert the lid of a Dutch oven slightly moist and bake the bread covered for about 20 minutes). Bake at 400 F for 10 minutes. Reduce the oven temperature to 350 degrees F and bake for an additional 40 minutes. Cool on a wire rack. 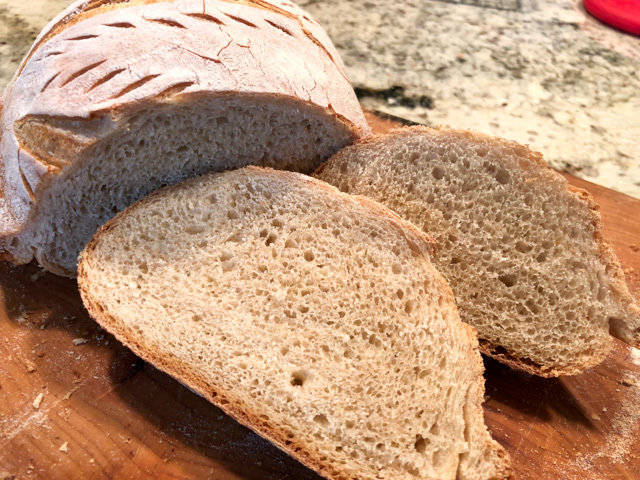 Comments: As you know, I love sourdough baking, but there’s something wonderful about having a loaf of bread cooling less than 3 hours after gathering the flour. In fact, the dough was quite fast to rise, it did not need 75 minutes for the bulk fermentation, in 65 min it was more than doubled, so I shaped it. And instead of allowing a full hour for the final rise, I decided it was good and ready at the 50 min mark. I toasted the nuts the evening before, and added them to the food processor right before mixing the dough. Easy as pie, except for the fact that the goal was to make a walnut bread and it turned into a pecan bread with a hint of walnuts. It is my personal saga, a perverse Flour-Vinegar-Nut trilogy. When it comes to those items, I am always stumped by the difference between what “I think I have”, and what “I do have” in the pantry. 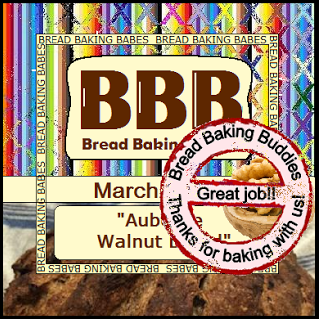 But, I can tell you that pecans worked very well, and the bread tasted terrific! Very moist, I am sure it would have lasted for several days at room temperature, but since it’s just the two of us, on the second day it was sliced and frozen for future enjoyment. 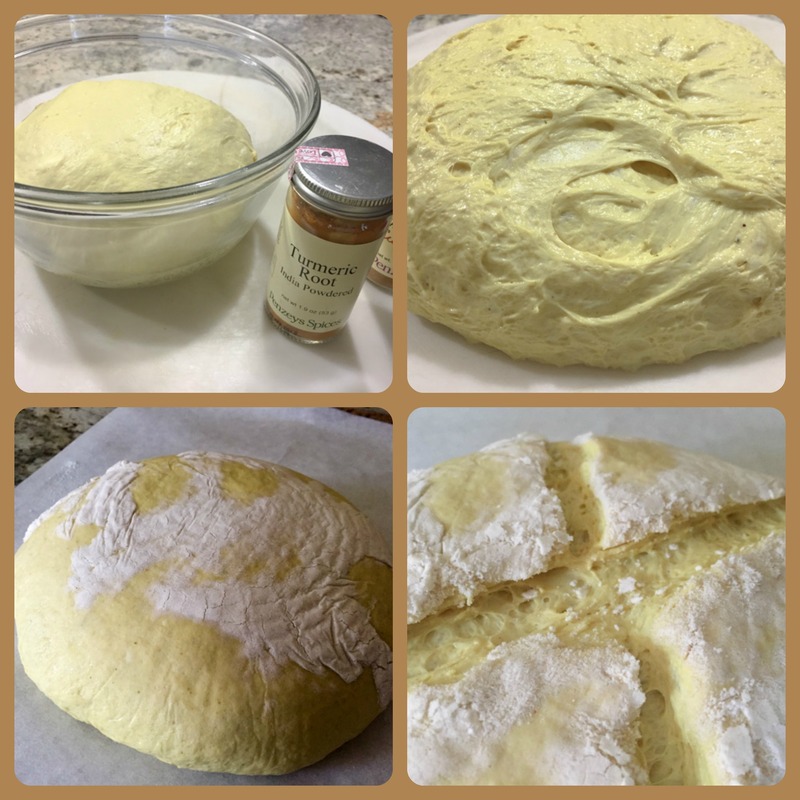 You know you’ve been blogging for too long when you’ve got several focaccia recipes in your site… Granted, I had no intention of trying a new recipe. Instead, for our Halloween party I was set on using one of my tried and true blogged about not too long ago. However, in typical Sally fashion, I never bothered to check the recipe the day before. I knew I would be up very early and c’mon, how long can a focaccia dough take? It turns out that very long. For the recipe I had in mind, the dough goes through a fermentation overnight in the fridge. Bummer. A quick plan B was set into motion, and a frantic calm and collected google search took me to one of Anne Burrell’s recipes from years ago. Not surprising when Anne is concerned, her focaccia calls for a substantial amount of olive oil, more than any other I’ve ever made. I actually cut the amount a little and it was still delicious and with a crust that left our guests going back for seconds. And thirds. 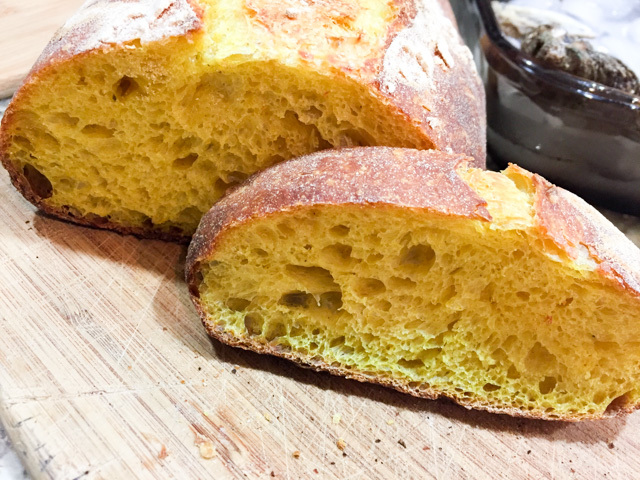 A very simple recipe to put together even if you decide to bake focaccia on a whim. Combine the warm water, yeast and sugar in a small bowl. Put the bowl in a warm, not hot or cool, place until the yeast is bubbling and aromatic, at least 15 minutes. In the bowl of a mixer fitted with a dough hook, combine the flour, 1 tablespoon of kosher salt, 1/2 cup olive oil and the yeast mixture on low-speed. Once the dough has come together, continue to knead for 5 to 6 minutes on a medium speed until it becomes smooth and soft. Give it a sprinkle of flour if the dough is really sticky and tacky. Transfer the dough to a clean, lightly floured surface, then knead it by hand 1 or 2 times. Again, give it another sprinkle of flour if the dough is really sticky and tacky. Coat a jelly roll pan with the remaining 1/4 cup olive oil. Put the dough onto the jelly roll pan and begin pressing it out to fit the size of the pan. Turn the dough over to coat the other side with the olive oil. Continue to stretch the dough to fit the pan. As you are doing so, spread your fingers out and make finger holes all the way through the dough. Liberally sprinkle the top of the focaccia with some coarse sea salt and Herbes de Provence, then lightly drizzle a little oil on top. Bake the dough until the top of the loaf is golden brown, about 25 to 30 minutes. Remove the focaccia from the oven and let it cool before cutting and serving. However, it is MIGHTY TASTY!